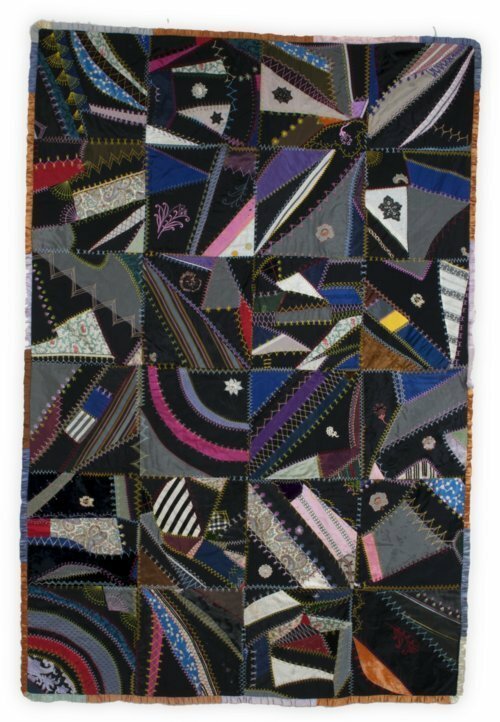 Small quilt or throw made in Crazy Quilt design, with 24 blocks of irregularly shaped multi-colored silk pieces. Each piece is outlined in embroidery stitches. Most blocks are ornamented with additional embroidery or appliquéd with lace ornaments trimmed in small beads or French knots. Edges are trimmed with narrow ruffle of silk taffeta ribbon in a variety of colors. Dark blue silk brocade backing, tied with narrow silk ribbons. Embroidered at one corner on backing: "Made for / Omer L Sharp / by his Mother / Virginia A Sharp / May 1908." Omer was born in Kansas on May 20, 1882, to Campbell and Virginia Jessee Sharp. The family lived in Brown and Sheridan counties. Omer married Cora Dell Montgomery only three months after the quilt's inscription, indicating it may have been a wedding present.